In a new assessment of nine state-of-the-art climate model simulations provided by major international modeling centers, Michael Rawlins at the University of Massachusetts Amherst and colleagues found broad disagreement in the amount of atmospheric carbon dioxide (CO2) annually sequestered in tundra and boreal ecosystems of Northern Eurasia, a vast, understudied region of the world. Rawlins also identified a trend among the nine models that shows the region's land carbon sink has been strengthening in recent decades, drawing in more carbon than expected, driven by increases in carbon uptake from plant growth that outweigh respiration increases. But lately, it shows signs of weakening. "As a group, the models tend to overestimate carbon emissions from land, particularly in autumn," he says. "They generally underestimate the present-day carbon sink, in our view. So there is good news, in that the region is likely storing more of the carbon being emitted by human activities than the models depict. But the lack of agreement across the models is a concern." He adds, "Given the wide range in sink strength across the models, we are recommending that decision makers not rely on a single model for predicting what the future of the Arctic may be. This could lead to a very biased assessment." Findings appear in the current issue of Biogeosciences. The lack of agreement "is not for a lack of effort on the part of modeling groups," Rawlins points out, but rather from a lack of available data to improve understanding of key processes. Northern Eurasia is critically undersampled, with much less field study than other parts of the Arctic. For this model intercomparison supported by NASA, Rawlins and the team examined simulations from nine land models participating in the Model-Integration Working Group of the Permafrost Carbon Network (PCN). Group members from each center conducted retrospective simulations from 1960 to 2009, producing current best estimates of the flow of CO2 between the land and atmosphere. They compared the model data with satellite and land-based measurements to establish model credibility. Rawlins and colleagues also found that residence time of carbon in soils is decreasing in response to warming temperatures that enhance both carbon uptake from plant growth and carbon emissions from soil litter decomposition. "In essence, carbon is moving through northern ecosystems at a faster rate," he points out. This study and others from the PCN are helping modelers to refine representation of carbon fluxes and storages across permafrost regions, Rawlins says. 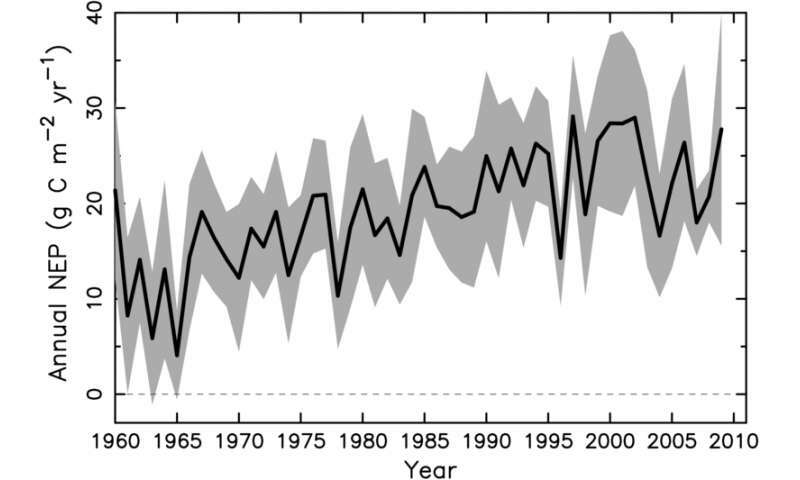 The best climate models constantly evolve, adding multiple interacting variables over time. However, the simulation of terrestrial ecosystem processes is currently inadequate. "Models do a good job at simulating some elements of the climate system, but they disagree on key aspects of the land-atmosphere CO2 exchange, and in particular the amount of carbon being sequestered," he explains. Statistically speaking, the range in model estimates of net productivity, which closely approximates the net CO2 sink, is twice the multi-model average. "This speaks to the level of uncertainty in sink strength," the climate scientist says. Rawlins and the team point out the need for new field data on vegetation and soil characteristics for model parametrization and validation. "Comparisons with the few available tower-based measurements suggest that the models tend to overestimate land carbon emissions in spring and autumn. However, the lack of data across this large area limits our confidence in this bias. There is an obvious need for establishment of more research sites. Additionally, soil measurements at new locations must be made at several depths, and during autumn, winter and spring," he notes. They also provide additional recommendations to improve model simulations of Arctic carbon cycle process, writing that investments must be made to develop new benchmarking datasets from measurements and remote-sensing observations and to support coordinated model intercomparison studies using standardized driving variables. Why are all the climate models so wrong? Because they are all based on the same al.go.re.dumb. Real science continually turns up new evidence. And such evidence continually upsets so-called "settled science". This is one of 2 articles today alone indicating that carbon is sequestered in far greater amounts than previously assumed by the climate models. If the evidence changes, then the predications should change. But since they are "settled science" I don't suppose they will. The predictions are based generally on the measured rate of accumulation of GHG in the atmosphere. When compared to the known rate of emissions, there is an excess of some gases including CO2. Scientists, being clever folks, noticed this and started looking around to see where that carbon was going. Here, they have found a place where some of it goes. That will not change by one molecule the (measured) amount or rate of accumulation in the atmosphere, or the results of that accumulation. Real science continually turns up new evidence. And such evidence continually upsets so-called "settled science". What an idiotic statement. You conflate two extremes, then strawman argue your way to dismissal. Science does, in fact, continually update the models, the modelling, the parameters and the inputting of new, better information. This does nothing to change the overall findings, which is settled and accepted across all scientific disciplines. Your feeble attempts at denial notwithstanding. Oh, that's OK then as climate science does too. That's why you are here denying all of it as Phys.org posts it. If there were any finding other than anthro CO2 behind AGW then climate scientists would be all over it, and if found sound, would follow that avenue. "Settled science" is regards to the mechanism (the greenhouse effect). It is a basic fact of physics that emitting greenhouse gases causes energy to build up in the system. Trying to model the global and regional impact of that energy across global climate and across time is always going to be a work in progress. We create models and we then update those models as new research becomes available. This is what we do in every single science where we have a mechanism mapped to a system. So the accusation that "climate change isn't real because it's models aren't 'correct' is nothing but a deliberate misrepresentation by people whose job is to confuse. Interesting... you do realize you are putting words in people's mouths though don't you? What I'm arguing for is an acknowledgement of the inherent flaws and uncertainty in our attempts to predict climate change when we don't have nearly all the pieces of the puzzle. Take your above logic and reverse it... "we understand one component (greenhouse effect) of the climate thus our models are accurate and our predictions WILL come true". Equally silly, no? If we can start out acknowledging the flaws of our assumptions then perhaps we actually have the basis for an intelligent conversation. A quibble. Models are not perfect, and they are intended to give a close approximation. Their accuracy increases as better information is added, They will never be perfect, but they are relatively accurate. A strawman. We understand many aspects of earth's climate, not just one. You are intimating that because we don't understand everything, we understand nothing. The fallacy of Argument from Incredulity"
You are intimating that because we don't understand everything, we understand nothing. The fallacy of Argument from Incredulity"
And YOU say I'M making strawmen. But if you think the AGW frenzy isn't sitting almost entirely on a foundation built from the spectroscopic properties of greenhouse gasses, you're being intentionally naive. You ARE making strawmen. Your lack of understanding makes you think you have understanding. That you think the science of climatology is based "almost entirely" on "spectroscopic properties of greenhouse gasses" beggars the imagination. You truly have no idea what you are talking about, and you continue to argue from a position in incredulity. Your statement is backed up by your opinion and nothing else. My stance on climate model/theory is backed up every time science is forced to say, "Oh, we didn't know that" which is regularly. It's not science's fault... it's doing exactly what it's supposed to in an attempt to get closer to the truth. It's the fixed positions of people like yourself, however, that's the issue. Stop using models and the arrogant (and wrong) attitude that we understand what is going to happen to the climate as a basis for action. I've never been against efficiency, energy demand reduction, new energy sources etc. I just don't want it done under the extremely flawed notion that those actions are somehow going to "fix" the climate. We aren't in control and never have been. It has been said many times on here, that the THE chief unknown, and THE chief error in GCM's - is the ENSO/PDO cycle. Why? It cannot be forcecast on times scales that GMC's require and as such the length/magitude of it may well even be in direct oposition (doubling the error). This uncertainty is of course accounted for in the error bars. Certainly there are aspects of climate science that are uncertain - outcomes of SLR being perhaps the biggest. And saying it many times makes it true? I'll agree that an increase in greenhouse gasses increases the insulative properties of the atmosphere and the POTENTIAL for warming. Our simple models will hold relatively true as long as none of the KNOWN unpredictables (ocean currents (I know, we're working on it) solar output, cloud cover, snow cover, volcanic activity, meteors, adaptations of life, etc) don't have any effect. Never mind the unknowns. That alone is a pretty big assumption. This is not a closed, unchanging system we are dealing with. Models rely on us visualizing the Earth as a laboratory where environmental conditions and inputs are controlled. Models are still best guesses and should have nothing to do with decision-making on the global scale. That's the reason we need a morally sound reason to work towards energy and resource efficiency. We should do something because it's the right thing, not because models that will time and again be proven lacking say something "bad" will happen if we don't. If mankind survives a million years, we will bear witness to numerous catastrophes... droughts, floods, extinctions, ice ages... and these will all happen even if we stop producing CO2 altogether. We have to stop presuming that controlling anthropogenic CO2 is the key to preventing change. Change, death, creation are going to happen no matter what we do. we simply need to do the best we can to live lightly and then hang on for the bumpy ride. cont...of the trend that can be expected if certain parameters are met. You are again using the fallacy of argument from incredulity - you intimate that because we cannot know everything, we therefore know nothing. It is not arrogance to state there is knowledge and understanding of how the climate will likely react to certain stimulus. It is most assuredly arrogance, however, to state with unwavering certainty that we cannot have an effect on a finite system. It is not a matter of "control", whatever you might perceive that to be. It is a matter of taking action to try and prevent the effects of our previous actions from overwhelming our planet and, in turn, us. It is clear and unequivocal that the climate is changing. It is almost certainly changing because of the changes we have introduced. The planet will adapt, eventually. But almost everything living here with us now will be gone, including our prodigy, if we do not slow the change down. Is it even possible to differentiate between natural and anthropogenic effects? Lets assume the changes were natural... do we suddenly back off and let things be? I can guarantee you we wouldn't because change, period is something we fear and is the basis for the current AGW panic. Our survival is not reliant upon stabilizing the Earth's climate... it's reliant on learning to adapt. You are again using the fallacy of argument from incredulity - you intimate that because we cannot know everything, we therefore know nothing. It is not arrogance to state there is knowledge and understanding of how the climate will likely react to certain stimulus. It is most assuredly arrogance, however, to state with unwavering certainty that we cannot have an effect on a finite system. And you are again putting words in my mouth. You cannot have billions of large lifeforms on a planet WITHOUT having an effect. The question is, is that change morally "wrong" or is it just reality? On a small scale, do you judge beavers for drowning forests? Are they creators of ponds/wetlands or destroyers of trees? There has never been any ill intent on our part besides survival... any other species, given the capacity and opportunity, would do exactly what we have. But almost everything living here with us now will be gone, including our prodigy, if we do not slow the change down. what "facts" actually influence that statement? I see no reality in that belief, only fear. All this is not to argue against continuing to make better, more efficient use of resources and energy. But it's worth pointing out that if lack of change is the guide we use determining whether everything is ok or not, we are going to continue living with fear and disappointment, no matter how much CO2 we take out of the atmosphere. And saying it many times makes it true? Yes ... because the science I linked to, and much more, is the basis for saying so. Just common sense to go with the best shot we have. Not fear - just common sense. And indeed based on the totality of the science. Facts enough for me, If not for you. If you expect fact from forecasts you will wait a very long time. The reality, cannot of course, ever be realised before a forecasted Event. A probability of 50% of rain on a given day is, after the fact realised as either 0 or 100%. It is up to the person who receives that forecast what he/she does with it. So you would go with the 0%? That's fine if it matters not that it rains. I believe in the precautionary principle which states that if you put your daughter on a long haul flight and when asked of the pilot "what is the probability of you crashing".... he says, "1%". Would you put your daughter on that flight. I know what I'd do. Well I was actually hoping for you to show me concrete evidence of mass extinctions due to warming. I know they have happened because of cooling before (the Younger Dryas for example) but historically speaking, the general rule has been, the more warmth and CO2 there has been, the greater the abundance of life. Why don't you look at ever extinction. As best as can be decerned, every global mass extinction was proceeded by a global warming event. An asteroid strikes the earth causing cataclysmic volcanic events, causing CO2 values to skyrocket along with temperatures. These events happen all throughout Earth's multi-billion year history. I don't know if all extinction events were caused by global warming, but certainly the Permian-Triassic extinction event, the most severe in earth's history, was due in large part to the enormous amount of CO2 that was dumped into the atmosphere and the resulting temperature rise (likely > 8C). You know what, I'll personally retract that link. In my search for other comparable data (of which I haven't found any yet) I've become skeptical of its validity. Going to take some time to check references.